Elmer Gertz was born in 1906 and died in 2000. Throughout his long life, he practiced law in Illinois. He grew up in an era when a lawyer was a respected man in the community-- a person of learning and integrity. Gertz personified that ideal. His interests were wide ranging. As a young man he co-authored a biography of Frank Harris, the English author and later founded a Civil War historical society whose members prepared papers on that conflict. Long active in local bar associations, Gertz was elected to the Sixth Illinois Constitutional Convention in 1969 and chaired the Bill of Rights Committee. Among his clients was Henry Miller, whose novel, The Tropic of Cancer, the lawyer defended in a celebrated obscenity trial. Through his civic activities, Gertz met many public figures, including Harry Truman. Here, in an exclusive interview with American Legends, conducted over a period of months before his death, Elmer Gertz recalls our 33rd President. AL: How did you first meet Truman? EG: I met Harry Truman in the early 1950s after he had left office. I was president of the Decalogue Society--a group of Illinois Jewish lawyers. We wanted to honor him for his good contributions. I went to his post-presidency office in Kansas City to make arrangements. We took to each other immediately. AL: Is it true that Truman kept an Israeli flag in his office? Truman had various Israeli items in his office, including a bust of Chaim Weizmann (the Zionist leader). I don't recall whether there was an Israeli flag. I see no reason why he should not have kept such things. He was the first international leader to recognize the independence of Israel and supported that state even when some in his cabinet opposed it. AL: Both Truman's Secretary of State--George Marshall--and his Secretary of Defense--James Forrestal--were opposed to recognition of Israel. Marshall and others thought only of oil and strategic concerns. They had no interest in Jews or Zionism. Truman had a great emotional concern for the rescue of the Jews by the creation of a state dedicated to receiving victims of the Holocaust. Gore Vidal has written that Truman was oblivious to European colonialism in Indochina and elsewhere. EG: Truman never discussed Indochina with me, as far as I recall. But I am troubled by any reliance on Gore Vidal as a credible critic. AL: A revisionist historian (Stephen Ambrose) has argued that dropping the A bomb was more of a warning to Russia than to defeat an already faltering Japan. EG: Truman felt that it was necessary to drop the bomb on Japan in order to end the war without great loss of life, and he was right, as proved by Japan's surrender after the bombs were dropped. AL: Was Truman a cold warrior? EG: He tried to stem the tide of communism and the aggression of the Soviet Union. It was necessary to do so, and he contributed to the eventual demise of the Soviet Union. AL: Arianna Huffington wrote in a Los Angeles Times column (August 15, 1998) that in 1945 Harold Ickes, Secretary of the Interior, condemned President Truman's "lack of adherence to the strict truth" and resigned from the Cabinet. "I don't care to stay in an administration," Ickes is supposed to have said, "where I am expected to commit perjury for the sake of the party." Arianna Huffington is a columnist that I loathe. I would not believe anything that she says. As to whether Harold Ickes believed that Truman was untruthful, that was his opinion, not mine. Ickes had strong views on many subjects, not all of which I accept. He should have admired Truman, but he was unreconciled to the passing of FDR. AL: Why did some people consider Harry Truman vulgar? EG: Some people mistook Truman's common touch for vulgarity. They misconstrued his plain and simple language. Truman never cursed in private conversation with me. AL: What is Truman's legacy? 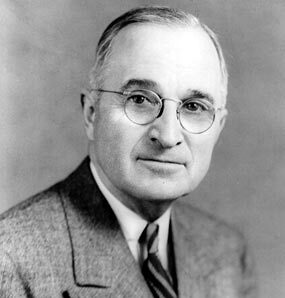 EG: Truman is important today because of his heritage of good works: the desegregation of the armed forces in 1948, NATO, and the Marshall Plan (1947) which provided financial aid to countries to keep them out of the Soviet Bloc. EG: Truman was special because he did not flee from responsibility. He did not pass the buck. His strengths were his willingness to assume responsibility, his knowledge of history and politics, his refusal to be daunted by rank and pretensions. His weakness was his excessive loyalty to the undeserving people around him. AL: Truman does not seem to have captured the fancy of the historians. Harry Truman was one of the truly great Presidents. He stands with the Roosevelts, Jackson and Jefferson, a bit below Lincoln and Washington.